So little birdie, call the Spring! 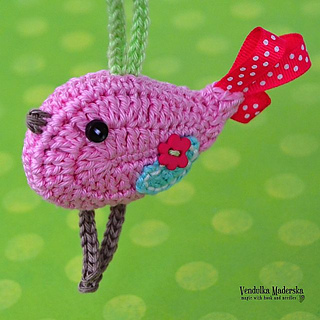 :-) This birdie ornament is great decoration for Spring. This pattern is written in standard American (US) terms, in English language, with step-by-step instruction and plenty pictures for succesfull completing of your work. I used these colors: 222 light pink, 165 light blue (you could also use 397 light turquoise – it is very similar), 236 pistachio or 392 yellow-green, 254 gray-brown, 105 beige. You will need approximately 7 g of yarn totally. 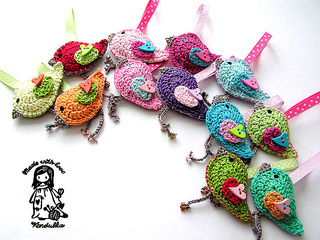 There are several tips for the yarn, you could use written in the pattern. 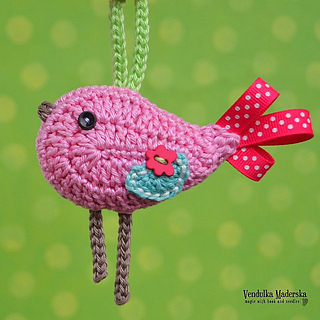 The size of the finished birdie: height 5 cm/1.9 inches (without the legs and hanger) x width 7.5 cm/2.9 inches (without the tail).